Recombinant Bovine interleukin-6 (PBP021) detected using Chicken anti Bovine interleukin-6 (AHP2380) as the capture reagent and Chicken anti Bovine interleukin-6:Biotin (AHP2380B) as the detection reagent followed by Streptavidin:HRP. Chicken anti Bovine interleukin-6 antibody recognizes bovine interleukin-6 (IL-6), a 23.8 kDa cytokine belonging to the IL-6 superfamily. Bovine interleukin-6 is a multifunctional cytokine secreted by a range of cell types, in particular T lymphocytes and macrophages. IL-6 has a range of activities and includes the differentiation of B cells into Ig producing cells, differentiation of lymphocytes and of monocytes. IL-6 functions in both a pro-inflammatory role where it is an important inducer of the acute phase response and also as an anti-inflammatory myokine (Febbraio & Pedersen 2005). Antisera to bovine interleukin-6 were raised by repeated immunisation of chickens with highly purified antigen. Purified IgG was prepared from whole serum by affinity chromatography. This product may be used as a detection antibody in a sandwich ELISA together with AHP2380 as the capture reagent. Recombinant Bovine interleukin-6 (PBP021) may be used as a standard. This product may be used as a capture antibody in a sandwich ELISA together with AHP2380B as the detection reagent. 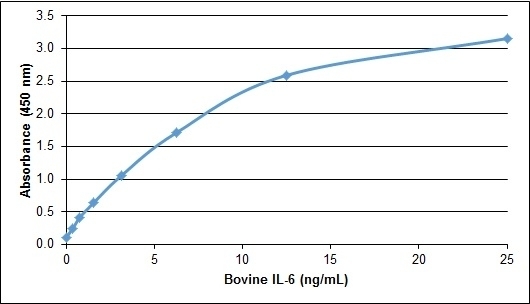 Recombinant Bovine interleukin-6 (PBP021) may be used as a standard.